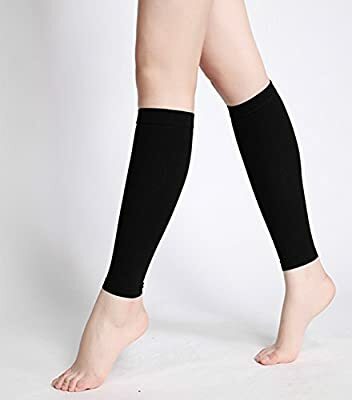 Calf Compression Sleeves - Leg Compression Socks for Shin Splint, Calf Pain Relief - Men Women Sleeve for Running, Cycling, Maternity, Nurses. Provides true graduated compression to promote blood circulation and oxygen flow. Prevents injuries such as cramping, fatigue, soreness and swelling. Perfect for muscle recovery, spider, varicose veins and diabetic. Instant support and relief, you will feel the difference immediately. Get fast pain relief with less swelling, soreness, and discomfort. It helps stabilize muscles, prevent pain, injuries, and shin splints due to running, basketball, or everyday activities. Design for extra support of the posterior & anterior calf muscles & achilles tendon. Pin-point compression provides targeted support where it is needed the most. Great for athletic, travel, or daily wear. Ideal for running, basketball, Crossfit, workout, training, golf, tennis, hiking, cycling, nurses, varicose veins, and leg cramps and more. You'll love our compression sleeves. Whether you have aching calves, leg cramps, swelling or edema, shin splints, POTS or varicose / spider veins these sleeves allow you to train harder, recover faster & feel stronger. They help boost circulation in your legs & reduce muscle soreness for recovery afterwards. Your satisfaction is our guarantee! If you are dissatisfied for any reason, please let us know and we will refund your payment and you will receive our satisfaction guarantee policy and 5 star customer service in the first 30 days!